Welcome to the pictures page. There are... well, just a LOT!of pictures in total in all the pictures pages, (I lost count at 100) most are from a variety of P/T pages. Please do not send me any mail saying the pictures belong to you unless you took the screen capture. If you did, then I will put your name in as credit. starred pictures are pictures that I've "fine-tuned"... or, in laymans terms, screwed around with to make look better... but, they're stil not mine, so go ahead and take. "Of course not. Wouldn't want to get too sentimental, would we?" This one is from Before and After. This picture Lauren got for me somewhere. I don't know where she got it from, or who. So if that person visits me and complains. sorry! I didn't know, I just thought it was cool. From, DISPLACED. Very cool episode. 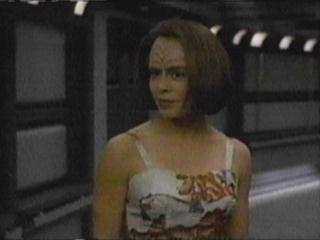 This one is one of my favorite B'Elanna pictures. It's from the first all-time episode... Caretaker. 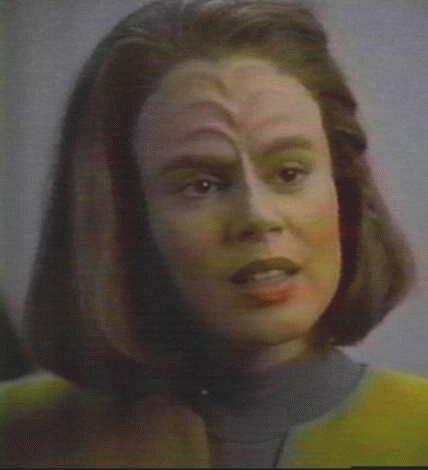 It's when B'Elanna first wakes up next to Harry in the Ocampa's hospital-type-thing. I like it because it shows the fear in her face, and you almost never see that in her. <---Isn't she really pretty in this picture? 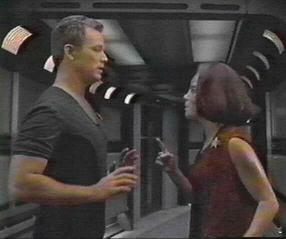 B'Elanna... getting Tom's scent... for a Klingon mating ritual. Odd, yet, still entertaining. ;) This one is towards the end, when the fever is purged. You know, right after she beats the $#!% out of Vorick. I think this one is when she first realizes she's going throughthe Pon Farr. That's why she's got that "huh?" look on her face. This one I think is from Real Life. We really like her face in this one. She's so gorgous! Is that a braid in her hair? This one is from Faces. 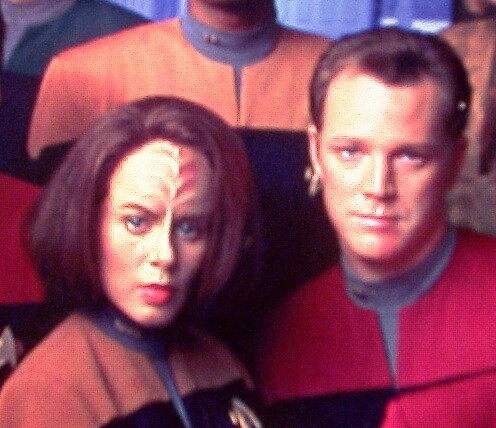 Just before human B'Elanna faints. This one is sooo cute. I got it from...somewhere, It's from Vis a' Vis. Despite the fact that it is not Tom, it's Steth, it's still cute. These next three are from Blood Fever, Revulsion and Scientific Method. Just three of the many that could prove my point. Now, am I the only one that notices this, or does Tom always cradle B'Elanna's face whenever he kisses her? This one is from Waking Moments. I know it's a pretty pathetic P/T picture but that's not why we put it up. When me and Amber saw this one faithful Wednesday night, we saw the scene when Tom opens the door for her and noticed that stupid jacket. After commenting on how dumb it looked, we remembered something from TNG that looked familiar.... Gates McFadden wore a jacket just like that one to cover her pregnancy in ST:TNG. 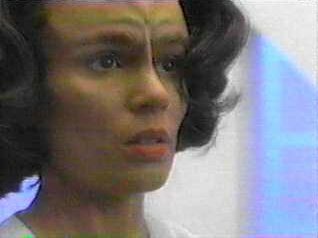 We made the connection and realized Roxann Dawson was pregnant before any of the sites had it down! Yea for us! This was the first episode with the jacket. Did you see? I believe this is from Worst Case Senario, either that or possibly Alter Ego. They live in their own world with their own conversations... even in a meeting. This one is from, Alter Ego I believe. 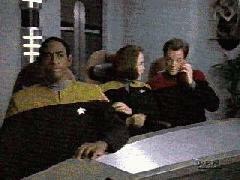 After Tom comments on B'Elanna's "Smashing" dress. 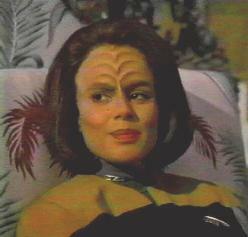 Another from Faces... probably the only good pic of the full Klingon B'Elanna I've seen. It's a paramount pic, so give a credit for those genious photographers down at the lot.